Hacking Lifehacker’s “How I Work” Series – FREE DOWNLOAD! I’ve always been a big fan of Lifehacker’s “How I Work” series, especially the earlier ones. But one thing that has been on my wish list is a searchable index of all the “How I Work” interviews as I have no idea which interviews I’m missing, or which are the most popular ones. So I decided to create one. I first used Screaming Frog SEO Spider to pull out all the links and titles from Lifehacker, tagged How I Work. This however, omitted all the 2012 and most of the 2013 interviews so I had to manually scrape the site (which I had to do to extract the dates anyway). I then used my favourite tool Blockspring to add shared count to each URL. 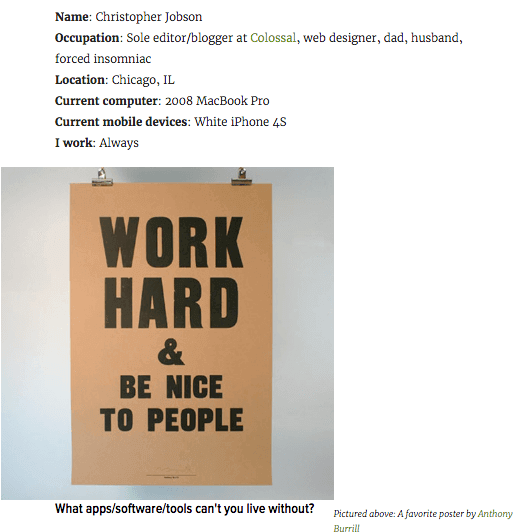 From January 2012 to March 2016: 164 “How I Work” and 29 “Behind the App” interviews. Searchable by name and sortable by shared count across the various social media channels! Using another one of my favourite tricks, conditional formatting, I wasn’t surprised to see Tim Ferriss, Guy Kawasaki, Phil Libin popular on Google+, or Lauren McGoodwin (CEO of Career Contessa) popular on LinkedIn. What really surprised me were two major (and I mean MAJOR) outliers in the Facebook shared count data. If you exclude the two outliers, the average interview would get about 320 Facebook total shares, with a median shared count of ~190. 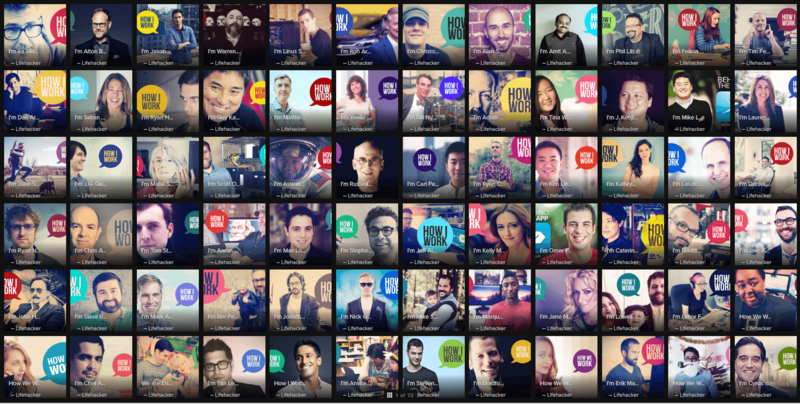 But Ira Glass’s interview was shared over 14,000 times and Alton Brown’s 10,282 times! That’s 6-8 times more than the next most shared interview! I thought perhaps I made a mistake and checked Buzzsumo but shared count data was right. 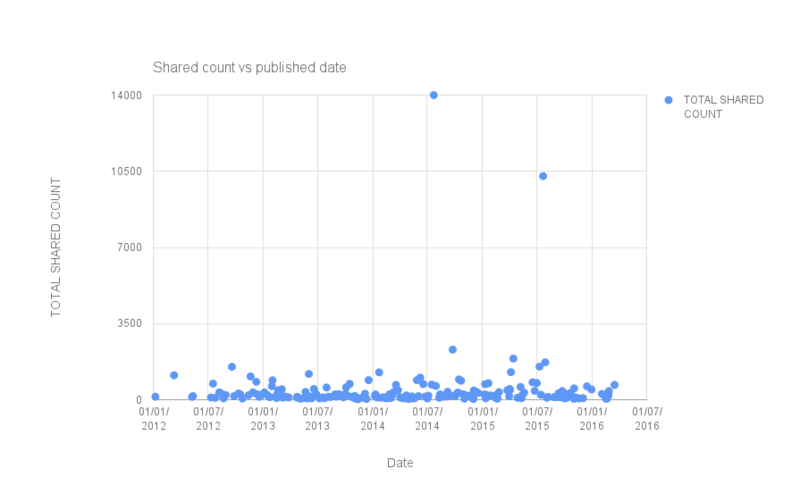 So I tried to see if there was any correlation between shared count and date published but nada. I would love to know if my American friends or other Lifehacker fans are as surprised at this data as I am, or have a view as to why this is the case. Kinda sounds like something Pinners would like. I am not a Pinterest expert so perhaps Peg Fitzpatrick or Rebekah Radice would care to comment but wouldn’t that throw off pinterest analytics (or be a way for people to “game” pinterest stats”)? With that, I shall leave you to explore on your own as I have literally hundreds of interviews to catch up on! Previous PostHacking Click-to-Tweet and TweetDis! (with BONUS FREE Canva templates to remix)Next PostOver $750K of Founder Freebies and Deals Discovered!